Garmin International Inc., a unit of Garmin Ltd. (NASDAQ:GRMN), announced the addition of several new networking chartplotters and combination models to its popular GPSMAP product line – the GPSMAP 7x2/9x2 touchscreen chartplotters and the GPSMAP 10x2/12x2 keyed chartplotters. Garmin International Inc., a unit of Garmin Ltd. (NASDAQ: GRMN), the global leader in satellite navigation, announced the GPSMAP 276Cx, an upgraded reinvention of the classic 276C. Since its launch in 2004, the 276C has proven to be a versatile GPS navigator ready for land and sea. The 276Cx provides all the classic functionality of the original with all the latest technological improvements of the last decade in a device truly as unique as the customer who desires such performance. Garmin International Inc., a unit of Garmin Ltd. (NASDAQ: GRMN), the global leader in satellite navigation, announced the next-generation multisport GPS watch, fēnix 3. With the new EXO™ GPS antenna, fēnix 3 boasts features that support a full range of multisport activities, from advanced fitness training, to cross-country and alpine skiing, snowboarding, as well as hiking, climbing and trail running. Garmin International Inc., a unit of Garmin Ltd. (NASDAQ: GRMN), the global leader in satellite navigation, announced vívosmart – a stylish activity tracker with smart notifications. Stay on track with health and wellness goals while staying connected with vívosmart’s vibration alerts for calls, texts, calendar reminders, emails and more from a smartphone. Garmin International Inc., a unit of Garmin Ltd. (NASDAQ: GRMN), the global leader in satellite navigation, announced the 2014 nüvi Advanced Series, combining 5, 6, and 7-inch multi-touch glass displays with premium Garmin navigation. The 2014 Advanced Series is the first nüvi line that comes with Foursquare venues to help users explore new and popular restaurants, stores and more. 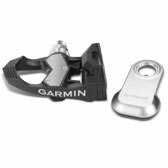 Garmin International Inc., a unit of Garmin Ltd. (NASDAQ: GRMN), the global leader in satellite navigation, today announced Vector S – a single-sensing pedal-based power meter. Measuring forces on the left pedal to approximate total power, Vector S reports power, cadence and more with the option for users to easily upgrade to a dual-sensing system. Garmin International Inc., a unit of Garmin Ltd. (NASDAQ: GRMN), the global leader in satellite navigation, announced results for the fiscal year and quarter ended March 29, 2014. Garmin International Inc., a unit of Garmin Ltd. (NASDAQ: GRMN), the global leader in satellite navigation, today announced the Forerunner® 15 — an affordable GPS running watch with daily activity tracking for all fitness levels. Garmin Forerunner 15 keeps runners motivated by tracking distance, pace, calories, personal records, and heart rate*. Garmin International Inc., a unit of Garmin Ltd. (NASDAQ: GRMN), the global leader in satellite navigation, announced the RV 760LMT, its first navigator created just for the RV lifestyle. The 7-inch GPS device is packed with signature Garmin navigation features as well as RV-friendly functions to guide RV drivers with confidence. Garmin International Inc., a unit of Garmin Ltd. (NASDAQ: GRMN), the global leader in satellite navigation, announced quatix™, its first GPS watch designed for avid mariners, both power and sail. Quatix combines the most pivotal marine features and provides both comprehensive navigation and sailing capabilities while integrating Garmin’s industry-leading GPS technology and user-friendly interface. Quatix allows mariners the freedom to enjoy the open waters while having the most important boating information on their wrist. Garmin International Inc., a unit of Garmin Ltd. (NASDAQ: GRMN), the global leader in satellite navigation, announced a premier addition to their fully-integrated line of GPSMAP series chartplotters and combination plotter/sonar units. Boasting a sleek new design, vibrant touchscreen and unsurpassed positioning technology, these eight new models offer boaters and anglers the features they demand. Garmin International Inc., a unit of Garmin Ltd. (NASDAQ: GRMN), the global leader in satellite navigation, announced the next generation of its award-recognized navigation system built into Chrysler vehicles. The new Garmin solution is part of the Chrysler Uconnect 8.4N infotainment system and includes several new features and enhancements. It is available for 2013 model year Chrysler 300, Dodge Journey, Charger and Dart vehicles (offered standard on some models and optional on others). Garmin International Inc., a unit of Garmin Ltd. (NASDAQ: GRMN), the global leader in satellite navigation, announced that it has sold more than 100 million of its products to motorists, pilots, boaters, runners, cyclists, golfers, hikers, hunters, and geocachers – who all depend on Garmin to help show the way. Garmin International Inc., a unit of Garmin Ltd. (NASDAQ: GRMN), the global leader in satellite navigation, today announced fourth quarter results for the period ended December 31, 2011 delivering EPS growth and revenue growth across all reported segments. Garmin International Inc., a unit of Garmin Ltd. (NASDAQ: GRMN), the global leader in satellite navigation, announced GPS-enabled sport watch - Forerunner® 210. Garmin International Inc., a unit of Garmin Ltd. (NASDAQ: GRMN), the global leader in satellite navigation, announced that it has been selected to be the exclusive official supplier of marine navigation, marine communication, and marine sensor equipment to the 34th America’s Cup. Garmin International Inc., a unit of Garmin Ltd. (NASDAQ: GRMN), the global leader in satellite navigation, announced the redesigned and upgraded eTrex® handheld GPS device – evolving from one of the world’s most reliable and popular handhelds, with millions sold. Garmin International Inc., a unit of Garmin Ltd. (NASDAQ: GRMN), the global leader in satellite navigation, announced the Montana™ handheld GPS device – the most advanced Garmin handheld featuring a ruggedized design with multiple mounting and battery options, dual-orientation and screen layout options and support for a wide range of Garmin cartography. Garmin International Inc., a unit of Garmin Ltd. (NASDAQ: GRMN), the global leader in satellite navigation, announced the Forerunner 610 sports watch – a slim, yet robust and weather-proof touchscreen solution for serious runners seeking an extra advantage. Forerunner 610 can stand up to rain, sweat and splashes, and is responsive enough that it can be operated with running gloves. Garmin International Inc., a unit of Garmin Ltd. (NASDAQ: GRMN), the global leader in satellite navigation, will show its in-dash navigation platform that is an available option for an array of 2011 model year Chrysler, Dodge, and Jeep vehicles. Dubbed the Uconnect Touch, the system will be available for demo in the Garmin booth (South Hall #35831) at the 2011 Consumer Electronics Show.